For me, May was the month of WordPress. A lot of interesting posts have been written and many of them have gone straight to my bookmark collection. And now it’s time to share some of these posts, so here’s a list of 6 valuable posts from the past month (May 2011) which I regret I didn’t come up with myself. Let me start by linking to a post that explains why blog comments are important and gives some tips on how to attract more of them. A quick and worthy read. 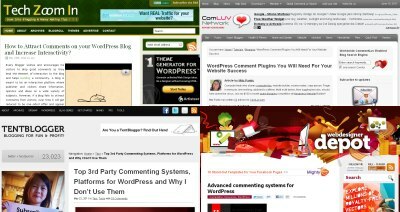 In this post Mitz shares a list of some really valuable plugins, divided into three sub-lists: ones that show the love, ones that encourage return visits, and ones that stop spam. It’s where the real fun starts. In case you’re not aware of this, you can choose to ditch the native WordPress’ commenting system and go with something else. In this post Cameron gives a nice list of alternative commenting systems and describes their main features. In this post John shares his opinion on what the top 5 commenting systems are. He also explains why WordPress native system might be better for most users despite all the features of other commenting platforms. Disqus is one of the most popular commenting systems in the blogosphere. To be honest, I’m considering switching to it myself. Check out what David has to say on abandoning native WordPress commenting system and switching to Disqus. In this short post Marko shares his thoughts on why installing Facebook comments on your blog might be a good idea. He also gives a quick 6-step guide on how to actually do this.